Combine Ground Beef and steak seasoning in large bowl, mixing lightly but thoroughly. Lightly shape into four 1/2-inch thick patties. Place patties on grid over medium, ash-covered coals. Grill, covered, 8 to 10 minutes (over medium heat on preheated gas grill, 7 to 9 minutes) until instant-read thermometer inserted horizontally into center registers 160F, turning occasionally. About 2 minutes before burgers are done, place buns, cut sides down, on grid. Grill until lightly toasted. 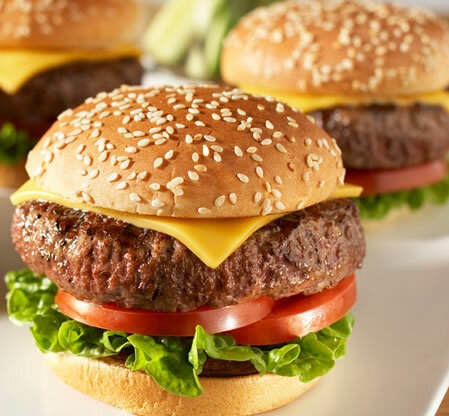 During last minute of grilling, top each burger with cheese slice. Line bottom of each bun with lettuce leaf; top with tomato slice, burger, and toppings, as desired. Close sandwiches. Alternative Method: To prepare on stovetop, heat large nonstick skillet over medium heat until hot. Place patties in skillet; cook 12 to 15 minutes until instant-read thermometer inserted horizontally into center registers 160F, turning occasionally.